Today was a combination of sun, rain, wind and clouds - but it was in the 70's so even the rain was warm. 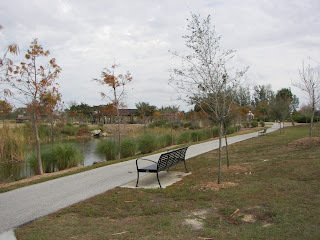 During a partly cloudy spell we went to Lakes Park just down the street to walk. We've been there before but this time we really explored and saw just how big the park really is. 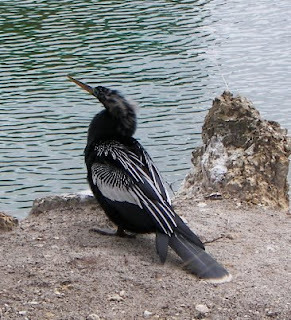 This is an Anhinga - also called the "piano bird" because of the white stripes on the wings. I've posted pictures of Anhingas before but I thought this one showed the white even better than the others. 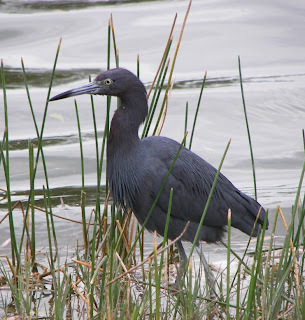 A Little Blue Heron. I love the blues and purples on their feathers. 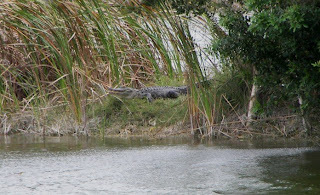 Check out this alligator on the bank. Remember, this park is just down the street from us! There were a lot of other people enjoying the break in the clouds. 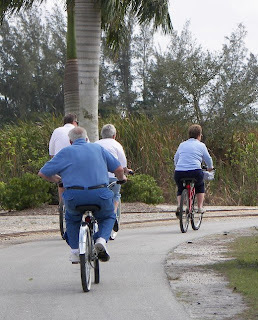 The park rents bikes and paddle boats. They also have a train that runs about 1 1/2 miles through the lake side. 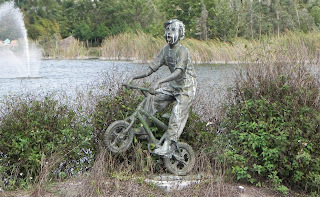 This bronze statue sits on a small island. The child's face is streaked with white from all the birds that have perched on him. There are lots of places to stop and rest or just enjoy the peace and quiet. They have an outdoor amphi-theatre and hold concerts, fairs and special events. 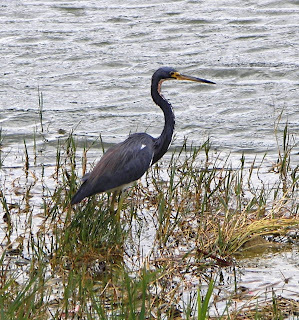 This is a Tri-colored Heron. I realized that I had not yet identified one so this was my goal for the day. I'm sure I've seen them before - but probably just thought they were Little Blue or Great Blue Herons. 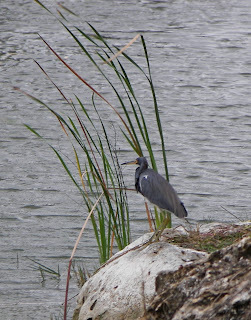 The Tri-colored Herons have a white stripe on the front of their neck and don't have the same blue and white patches on their head as the Great Blue. They are dark blue and stand just over 2 feet tall - about the same as a Little Blue. 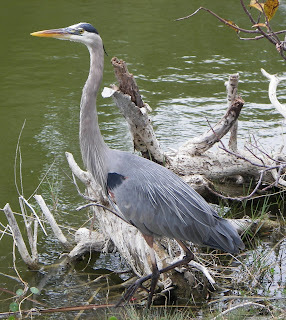 The Great Blue Herons can stand over 4 feet tall. They are still my favorite. We had an early dinner tonight and will probably turn in early as well.